SAP Business Objects Business Intelligence (SAP BO BI) 4.0 platforms is the Business Intelligence platform that supports the entire range of performance management, reporting, querying and analysis applications. It has proven architecture and platform support for semantic layers, Data integration, and security. SAP BO BI platform 4.0 provides full web-based administration and configuration of the entire system. 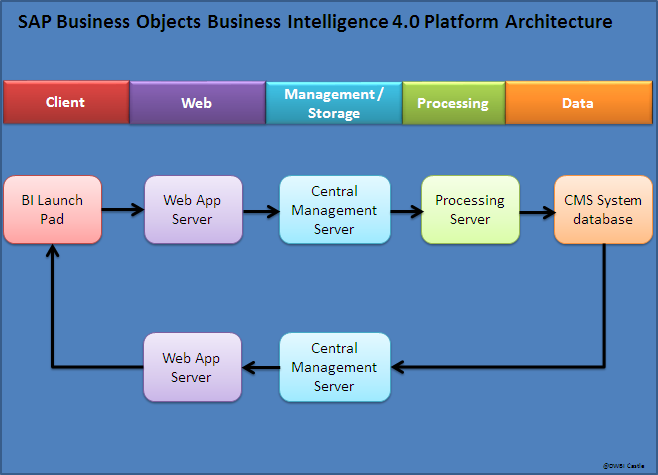 SAP Business Objects Business Intelligence 4.0 platform has series of conceptual servers / tiers. 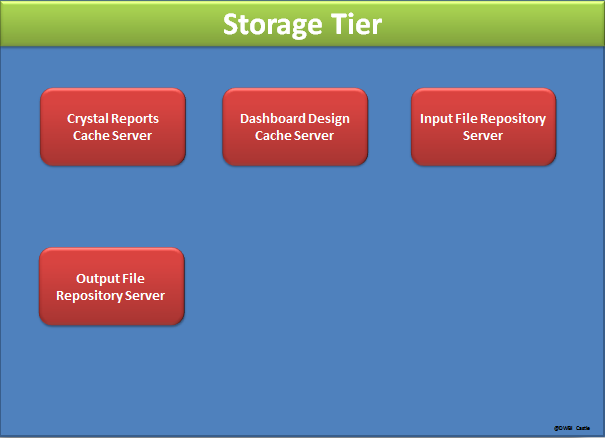 Each Tier / server has lots of its own processing or service servers. Below you can find the complete details about each tiers and their processing or services. 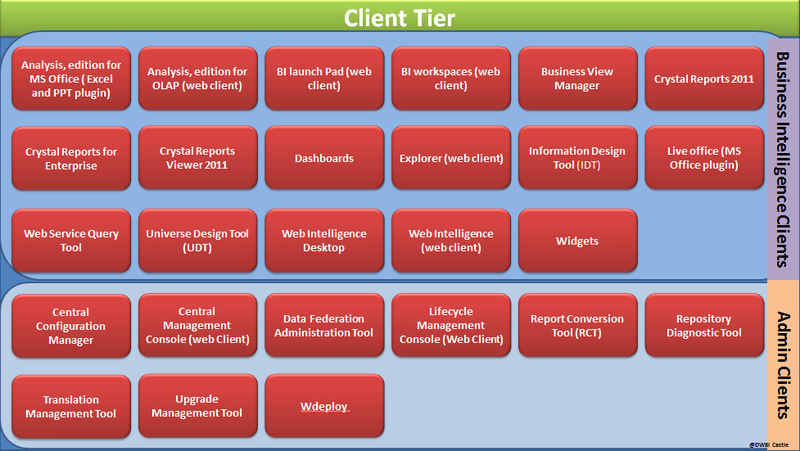 Client Tiers are classified into two types, such as Business Intelligence Clients and Administration Clients. SAP Business Objects Analysis, edition for Microsoft Office, is a plugin that integrates into Microsoft Excel and Microsoft Power point to be used as an online analytical Processing (OLAP) tool. It provides access to a range of OLAP data sources and also allows users to combine information from different systems within a single workspace. SAP Business Objects Analysis, edition for OLAP (formerly Voyager) is an online analytical processing (OLAP) tool for working with multi-dimensional data .It provides access to a range of OLAP data sources, and can also combine information from different OLAP data sources within a single workspace. BI launch pad (formerly Infoview) is the main web interface for business users to view, schedule, and keep track of published business intelligence (BI) documents.BI launch pad can access, interact with, and export any type of business intelligence including reports, analytics, dashboards, scorecards, and strategy maps. It access to BI content and tools, such as BI workspace SAP Business Objects Web Intelligence, SAP Business Objects Explorer, and SAP Business Objects Analytics, edition for OLAP. I workspaces (formerly Dashboard Builder) helps you track your business activities and performance using modules (templates for data) and Business Intelligence (BI) workspace (for viewing data in one or more modules). Modules and BI workspaces provide information needed to adjust business rules as conditions change. It helps you track and analyze key business data. It also supports group decision-making and analysis via integrated collaboration and workflow capabilities. BO workspace enables you to organize content in pages, create mash ups of Business Intelligence (BI) content, and present the information in a way that is tailored to the role of the user, either for personal use for sharing with others. Business View Manager allows users to build semantic layer objects that simplify underlying database complexity. Business View Manager can create data corrections, business elements, business views, and relational views. It also allows detailed column and row-level security to be set for the objects in a report. Designers can build connections to multiple data sources, join tables, alias field names, create calculated fields, and then use the simplified structure as a Business View. Report designers and users can then use the business view as the basis for their Crystal reports, rather than building their own queries from the data directly. SAP Crystal Reports 2011 is a Windows-based report design tool used to create powerful reports than can be published in the SAP Business Objects Business Intelligence platform. SAP Crystal Reports for Enterprise is a Java-based report design tool used to create and integrate powerful reports in the SAP Business Objects Business Intelligence platform. SAP Crystal Reports Viewer 2011 is a Java-based tool to view Crystal Reports. SAP Business Objects Dashboards (formerly Xcelsius) is a tool for data visualization and the creation of dynamic, interactive dashboards. Data can be updated dynamically from the SAP Business Objects Business Intelligence platform, and exported to a variety of different formats that can be viewed by data consumers in standard formats, such as PowerPoint, PDF, OR Flash. SAP Business Objects Explorer is an information discovery tool that empowers everyone in an organization with fast, easy access to information, so they can explore data, spark new ideas, and find new insights. The Information Design Tool is an SAP Business Objects metadata design environment that enables a designer to extract, define and manipulate metadata from relational and OLAP sources to create and display UNX universes. SAP Business Objects Live Office integrates with the Microsoft Office environment, allowing dynamically updated data to be embedded within Microsoft Power Point, Excel, and Word documents. In addition, you can share your documents with others over the web for collaborative decision-making. The Web Service Query Tool (formerly Query as a Web Service) allows Business Intelligence (BI) queries to be used in custom web applications. Business users create their own queries from a services so they can be incorporated into client applications. The Universe Design Tool (formerly Universe Designer) allows data designers to combine data from multiple sources in a semantic layer (UNV Universe) that hides database complexity from end users. It abstracts the complexity of data by using business rather than technical language to access, manipulate n and organize data. Universe design tool provides a graphical interface to select and view tables in a database. The database tables are represented as table symbols in a schema diagram. Designers can use this interface to manipulate tables, create joins between tables, create alias tables, create contexts, ad solve loops in a schema. You can also create universes from metadata sources. Universe design tool is used for the universe generation at the end of the creation process. SAP Business Objects Web Intelligence Desktop is an ad-hoc analysis and reporting tool for business users with or without access to the SAP Business Objects Business Intelligence platform. It allows business users to access and combine data from relational, online analytical processing (OLAP), spreadsheet, or text file sources, using familiar business terms in a drag-and-drop interface. Workflows allow very broad or very narrow questions to be analyzed, and for further questions to be asked at any point in the analysis workflow. Web Intelligence Desktop users can continue working with Web Intelligence document files (.wid) even when unable to connect to a Central Management Server (CMS). SAP Business Objects Web Intelligence is an ad-hoc reporting tool for business users with access to the SAP Business Objects Business Intelligence platform. It allows business users to access and combine data from relational, online analytical processing (OLAP), spreadsheet, or text file sources, using familiar business terms in a drag-and-drop interface. Workflows allow very broad or very narrow questions to be analyzed, and for further questions to be asked at any point in the analysis workflow. SAP Widgets are mini-applications that allow easy and fast access to frequently used functions and provide visual information from your desktop. SAP Widgets allow your organization to provide access to existing Business Intelligence (BI) content on the SAP Business Objects Business Intelligence platform. Or you can add Web Dynpro applications that are registered as Extensible Business Client Markup Language (XBCML) widgets on the SAP Net weaver Application Servers, as desktop widgets. Central Configuration Manager (CCM) is a server troubleshooting and node management tool provided in two forms. In a Microsoft Window environment, the CCM allows you to manage local and remote servers through its graphical user interface (GUI) or from a command line. In a UNIX environment, the CCM shell script (ccm.sh) allows you to manage severs from the command-line. The CCM allows you to create and configure Server Intelligence Agent (SIA) nodes and start or also allows you to configure network parameters, such as Secure Socket Layer (SSL) encryption. These parameters apply to all servers within a node. 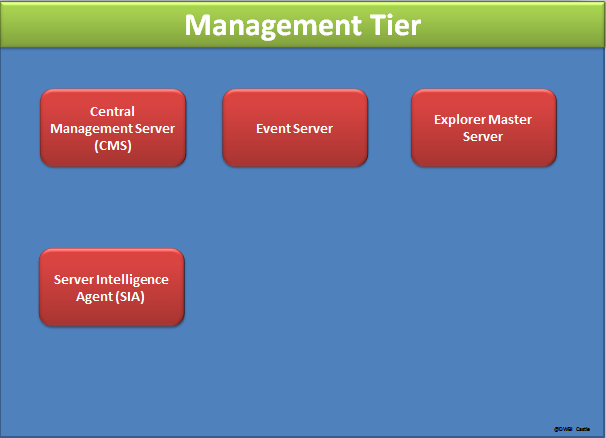 Note: Most server management tasks are now handled through the Central Management Console (CMC), not through the CCM. The CCM is now used for troubleshooting and node configuration. The Central Management Console (CMC) is the main web interface to perform administrative tasks in the SAP BO BI platform, including user, Content, and Server Management. It also allows you to publish and organize content, and configure security settings. The Data Federation Administration Tool (formerly Data Federator) is a rich client application that offers easy-to-use features to manage your data federation service. Tightly integrated in the SAP Business Objects Business Intelligence platform, the data federation service enables multi-source universes by distributing queries across disparate data sources, and lets you federate data through a single data foundation. The Data Federation Administration tool lets you optimize data federation query engine for the best possible performance. The Lifecycle Management Console provides a centralized view to monitor the progress of the entire lifecycle process. It is used to move content from one SAP Business Objects Business Intelligence platform to another of the same version. The Report Conversion Tool (RCT) converts Desktop Intelligence reports to Web Intelligence format, and publishes them to a Central Management Server (CMS). The Report Conversion Tool also lets you audit your converted reports. Report conversion will have three different statuses after the conversion and explains why. The Repository Diagnostic Tool scans, diagnoses, and repairs inconsistencies that may occur between the Central Management Server (CMS) system database and the File Repository Servers (FRS) file store. It can also report the repair status and completed actions. The Translation Management Tool defines multilingual universe and manages translation of universe and their Web Intelligence documents and prompts. The upgrade Management Tool guides administrators through the process of importing users, groups, and folders from previous versions of the SAP Business Objects Business Intelligence platform (formerly known as SAP Business Objects Enterprise). It also allows you to import and upgrade objects, events, server groups, repository objects, and calendars. WDeploy is a tool to assist in deploying SAP Business Objects Business Intelligence platform web applications, such as BI launch pad and the Central Management Console, to target application servers. The web server receives HTTP requests sent from the web client. The web server holds and manages static content such as .html and .js files that may be part of a SAP Business Objects Business Intelligence (SAP BO BI) suite web application. A web application server acts as the translation layer between a web browser or rich application, ans the SAP BO BI platform. The web application server hosts web applications, web services and SDK. Various web application servers running on Windows, UNIX, and Linux are supported. Note: If you do not have a web application server in place for use with SAP BO BI platform, the installation program can install and configure a Tomcat 6 web application server for you. 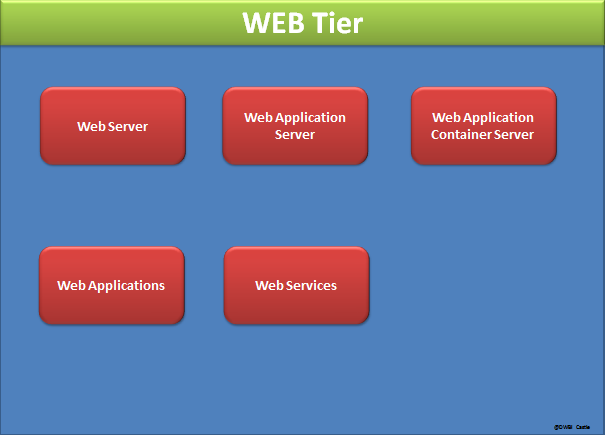 The Web Application Container Server (WACS) is an SAP BO BI platform server that allows SAP BO BI platform web services and web applications, such as the CMC and BI Launch pad, to run without the need for a previously installed Java web application Server. Web applications run in the web application server to process requests from the web client. SAP BO BI suite web application includes below applications. SAP BO web services include logic to understand and direct requests to the appropriate SAP BO BI platform server. SAP BO web services can be accessed by rich clients such as Live Office and Crystal Reports, and also by customer-build web service consumer applications. The Central Management Server (CMS) maintains a database of information about your SAP BO BI platform (in the CMS system database) and audited user actions (in the Auditing Data Store). All platform services are managed by CMS. The CMS also controls access to the system files where documents are stored, and information on users, user groups, security levels (including authentication and authorization), and content. The Event Server monitors the system for events, which can act as a trigger for running a report. When you set up an event trigger, the Event Server monitors the condition and notifies the CMS that an event has occurred. The CMS can then start any jobs that are set to run upon the event. Explorer Master Server manages all of the Explorer processing servers and below are those servers. A server Intelligence Agent (SIA) manages and monitors all of the servers on a node, ensuring that operates properly. Note: A node is a group of SAP BO BI platform servers that run on the same host. All of the servers on a node run under the same user account. One machine can contain many nodes, so you can run processes under different user accounts. The Crystal Reports Cache Server Intercepts report viewing requests sent from clients to the Crystal Reports processing Server. If the Cache server cannot fulfill the request on to the Crystal Reports Processing Server, which runs the report and returns the results. The Cache Server then caches the report page for potential future use. The Dashboard Design Cache Server determines if previously served Dashboard viewing requests would satisfy the current dashboard viewing request. If the request cannot be fulfilled by the Dashboard Design Cache Server, it forwards the request to the Dashboard Design Processing Serve. The Dashboard Design Cache Server will try to share previous data results as much as possible. The Input File Repository Server stores all of the documents and program objects that have been published to the SAP BO BI platform. It can store a large variety of file types. The Output File Repository Server stores all of the instances generated by scheduled jobs for all object types including Crystal Reports, Web Intelligence and programs. It also manages instances generated by the Web Intelligence Processing Server. It can store a large variety of file types. The Adaptive Job Server is a generic server that processes scheduled jobs for a variety of object types. Services that can be hosted on this server includes below. The Adaptive Processing Server is a generic server that hosts services responsible for processing requests from a variety of sources. Services that can be hosted on this server includes below. The Crystal Reports 2011 Processing Server responds to Crystal Reports page requests by processing reports and generating encapsulated page format (EPF) files. The Key benefit of EPF is that it supports page-on-demand access, so only the requested page is returned, not the entire report. This improves system performance and reduces unnecessary network traffic for large reports. The Crystal Reports 2011 Processing Server retrieves data for the report from the latest instance or directly from the data source. After it generates the report, it converts the requested data to one or more EPF files. These EPF files are then sent to the Crystal Reports Cache Server. The Crystal Reports Processing Server responds to Crystal reports for Enterprise page requests by processing reports and generating encapsulated page format (EPF) files. The key benefit of EPF is that it supports page-on-demand access, so only the requested page is returned, not the entire report. This improves system performance and reduces unnecessary network traffic for large reports. The Crystal Reports Processing Server retrieves data for the report from the latest instance or directly from the data source. After it generates the report, it converts the requested data to one or more EPF files. These EPF files are then sent to the Crystal Reports Cache Server. The Dashboard Analytics Server is used by BI workspace to create and manage corporate and personal BI workspace module content. The Dashboard Design Processing Server responds to Dashboard requests by processing dashboards and generating the results. The Dashboard Server is used by BI workspace to create and manage corporate and personal dashboards. Explorer Exploration Server provides and manages the Information Space exploration and analysis capabilities including search on data, filtering and aggregation. Explorer Indexing Server provides and manages the indexing of Information Space data and metadata. 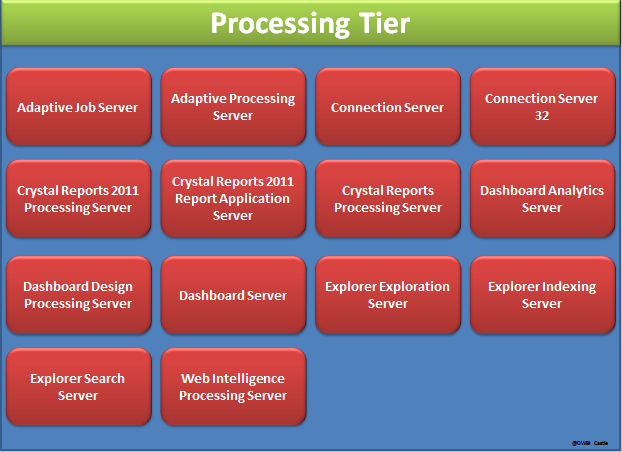 The Web Intelligence Processing Server is responsible for generating Webi Intelligence documents. The Web Intelligence Processing Server obtains document creation requests from the Web Application Server and then communicates with the Input File Repository Server in order to obtain a copy of the Web Intelligence Document (WID) file and the universe definition. While viewing an existing instance of a WID, the Web Intelligence Processing Server communicates with the Output File Repository Server to obtain an existing historical instance of a WID. It is maintained by Central Management Server (CMS) and is sometimes referred to as the system repository. 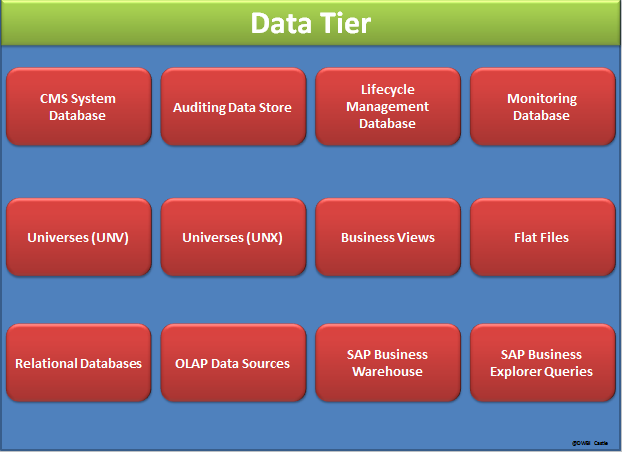 The Auditing Data Store (ADS) is used to store information in trackable events that occur in SAP BO Enterprise. This information can be used to monitor the usage of system components, user activity or other aspects of day-to-day operation. The Lifecycle Management Database tracks configuration and version information related to an SAP BO BI platform installation, as well as updates. The Monitoring Database is an embedded Java Derby database to store system configuration and component information for SAP supportability in the SAP BO BI platform. UNV Universes are identified by .unv file extension. They are the legacy type of universe based on the semantic layer in previous versions of the SAP BO BI platform (formerly SAP BO enterprise). They are built using the legacy Universe Design Tool. A Universe is an organized collection of metadata objects that enables business users to analyze and report on corporate data in non-technical language. These objects include dimensions, measures, hierarchies, attributes, pre-defined calculations, functions, and queries. The metadata object layer is built on a relation database schema or an OLAP cube, so the objects map directly to the Database structures. A universe includes connections to the data sources so that users of query and run queries and create reports using the objects in a universe without needing to know about the underlying data structures in the database. UNX Universes are identified by .unx file extension. They are new type of universe based on the new semantic layer in previous versions of the SAP BO BI 4.0. They are built using the new Information Design Tool. Business Views simplify report creation and interaction by abstracting the complexity of data for report developers. Business Views help separate the data connections, data access. Business elements and access control. Business Views can only be used by Crystal Reports and are designed to simplify the data access and view-time security required for Crystal report creation. Business Views support the combination of multiple sources in a single view. Flat file includes .txt, .csv, and .xls files. OLAP data sources store data in multi-dimensional cubes. SAP NetWear Business Warehouse (BW) is the OLAP data source from SAP. SAP Business Explorer (BEx) queries are used to analyze data in SAP NetWear Business Warehouse. BEx queries are built in the BEx query designer.